Fusilli - This small pasta with corkscrew-shape can be served in cold or hot. It is very good with any sauce, soups, and salads. Take advantage of its versatility to cook up a refreshing surprise in your next Fusilli dish. 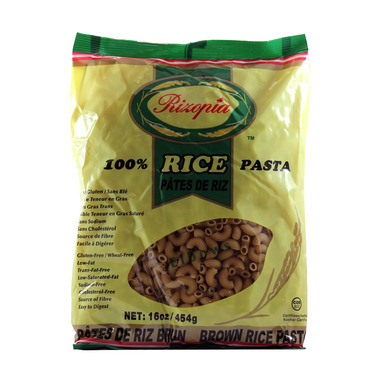 Rizopia provides the safest, tastiest, high quality gluten-free rice pasta line in the industry, all of which are made with great respects to the taste and the tradition of the 'Al Dente' Italian tradition. Ingredients: Whole-grain brown rice, rice bran and water. The texture and cooking was great but the taste is not my favourite. Tired other gluten free pastas and I didn't have this weird taste. Maybe it's the brown rice maybe it's this brand but won't be buying it again. Great pasta. Cooks well without overdoing it into mush. Good replacement for regular pasta for those of us who are gluten-free. Great pasta. Cooks up really well, doesnt stick, doesnt turn to mush! Love this product and all of the other ones in this line. They cook and taste just like regular pasta but they don't make us feel like we have lead weights in our bellies after eating it. This is the only pasta that I buy now. Great pasta at a great price. My family is not gluten free, but love it all the same. I find most rice pasta has a bit of extra starchiness in the water after cooking, so I usually just give it a quick rinse before plating. This is great pasta! I've cooked it several times and the first two times it was a bit rubbery. The last time I cooked it, it seemed better, perhaps because it was cooked longer at a lower temperature. Delicious with organic pasta sauce! I love the texture of the brown rice pasta - will most certainly buy it again. Great brown rice pasta. Have been using this for a few years now and cannot ask for more in a brown rice pasta. If we eat any pasta it is only brown rice (no wheat) and I enjoy this brand.